The Boathouse used to be one of those slightly tatty, worn-out pubs that had seen much better days. It was just underwhelming, in direct contrast to it’s superb position on the riverbank. The previous owners didn’t seem to have much clue about how to run the place, either. A few years ago, on the final Saturday of the Saltaire Festival, they closed for a private function, despite the several thousand people milling around the village. There were so many people that the beer festival was drunk dry. The pub eventually closed and became a favourite target for any passing arsonist. A series of fires left the building, a late add on to Titus Salt’s model village, as a burnt out hulk, its charred struts reflecting in the Aire. Walls were demolished, new ones built. A new roof went on. Huge glass windows appeared in doors that opened up across the whole front of the building. 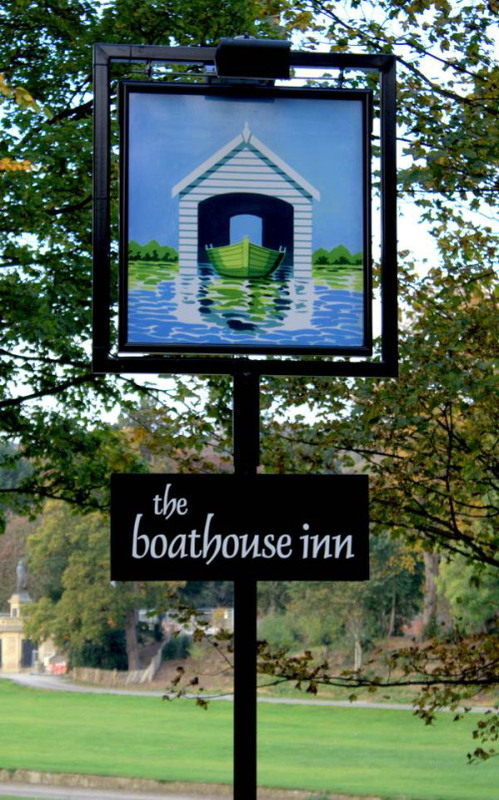 The Boathouse suddenly started to look, well, quite smart, and re-opened as a pub and restaurant with a friendly and relaxed style. We’d tried to get a table a couple of weeks ago, but found the place packed and had to trudge off to somewhere a bit second rate instead. This time, we got there early. The menu is a standard pub menu, with a few interesting twists, and a good range of specials. Everything you’d expect from a straightforward pub menu is there. If you want a plate of beer-battered fish and chips or a steak and kidney pie, you’ll be fine. It wasn’t the most interesting or innovative menu I’ve ever eaten from, but there were good, crowd-pleasing dishes on it, which isn’t really a bad thing. The specials are where the real interest lies. The waitress ran through the specials for us, which included pan fried sea bass, and a dish of pig’s cheek, braised slowly in a red wine sauce. There’s an offal dish on every day. Jenny must have seen my eyes light up. “You’re not having that”, she said, pulling a ‘this time I’m serious’ face. And so on, as the waitress looked on, bemused, before telling us that they only had one left. It did cross my mind that we’d only be ordering one anyway. By the time we came to order, the last pig’s cheek had been snapped up by somebody else, leaving me deflated and Jenny with a mildly victorious and satisfied air about her. I ordered the sea bass instead, Jen asked for a chicken Kiev. The sea bass was glorious. Two big fillets, perfectly pan fried, skin crisp, flesh still very slightly translucent, laid across a bed of new potatoes and spinach, surrounded with a rich sauce heavy with butter and cream, garnished with diced tomato. Jen’s chicken Kiev missed the boat completely. A chicken Kiev is one of those things that’s tricky to cook. There’s a high chance that the Kiev will split open slightly during cooking, secretly leaking the contents. The cook can’t tell if he’s been successful or not until the diner plunges a knife in to release a slick of garlic butter. Or not, as is often the case. Jen’s Kiev was completely empty. No butter at all. The chicken was a little overdone, which is probably where the problem lay, but it tasted quite good, rich with garlic and herbs. No slick of butter, though, and therefore the point had been missed. Jen had an Eton mess for dessert, which she thought was very good. Despite the butterless Kiev, we had a good evening in a very smart pub. Any pub or restaurant willing to put pig’s cheek on the menu deserves a second look. The serving staff were friendly and efficient, and the sea bass showed real promise. All they need to do is drop the chicken Kiev, keep the kitchen open longer and introduce some sort of reservation system. One thing to note – and this is a real clincher, at least for me – they have Saltaire Brewery’s excellent Saltaire Blonde on tap, a light and soft beer with a continental edge to it. It’s Saltaire Brewery’s best seller, and it’s easy to see why. 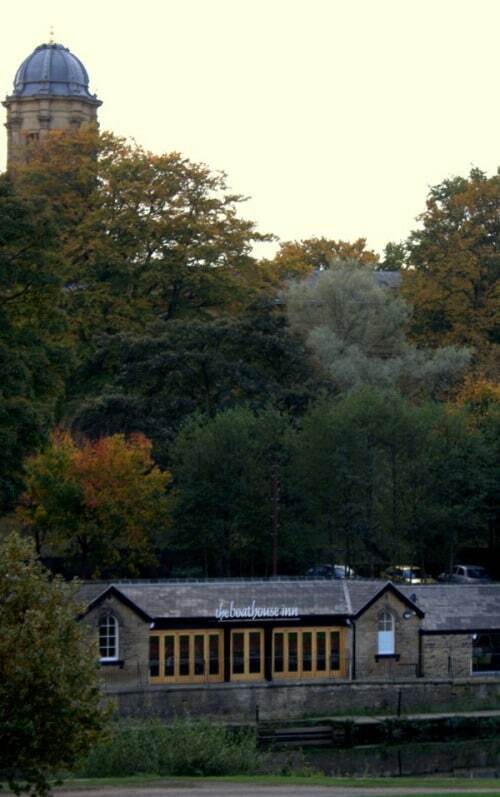 Oh goodness… Saltaire sounds idyllic! I can't wait to get back to the old country!